In 2008, Volkswagen created a racing series called the TDI Cup. Its essential purpose was to generate enthusiasm for VW’s new clean diesel engines by putting young drivers behind the wheel of slightly modified Jetta TDIs – the first clean diesel cars to arrive in the U.S. That same year, they debuted the Jetta TDI Cup “Streetâ€ Edition as a one-off for the SEMA show, seemingly to gauge interest in a gussied up TDI with a modified exterior and some upgraded parts. Both endeavors proved successful enough to bring the TDI Cup Edition to production this year, which means you can now get your hands on a Jetta TDI with components from the sporty GLI model. A body kit, new suspension, brakes and sway bar have turned the über-popular VW into a flashy, sporty version of the über-popular VW, and who can argue with that? Not surprisingly, the Jetta’s highlight is the ever-impressive 2.0-liter TDI engine, which delivers fantastic fuel economy – we’re talking 41 mpg highway here – without dulling the drive and nets you a $1,300 tax credit from the Man. 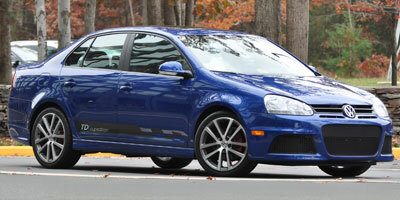 Just consider the Jetta TDI Cup Edition the antithesis of the Prius. Bet you like it now. The GLI components have dramatically improved the quality of the TDI’s ride, yet they haven’t diminished the fuel economy, which remains a huge selling point. With a stellar 41 mpg highway, the Jetta TDI has the potential to go 600 miles on a single tank. Aesthetic improvements are also worth mentioning, especially the body kit and plaid seats; they add a European hoon to the Jetta’s look. What’s not to love about free scheduled maintenance for three years or 36,000 miles? With the Cup Edition, you’re forced to give up a few luxuries like auto air conditioning and power seats. The steering could have been tightened up a bit to accommodate the new suspension. The front bumper extension will scrape in dips – people living in hilly or potholed areas, beware. As well as the Jetta TDI drives without any modifications, the extra suspension improvements turn this compact sedan into a much more entertaining vehicle to swing around corners, and in corners is certainly where you’ll feel the biggest difference. The Jetta remains perfectly level in hairpin turns, and despite improved handling, comfort doesn’t suffer, with bumps in the road easily absorbed. Steering is also fantastic, and the well-weighted, balanced feel is better than expected. The TDI engine provides a robust amount of torque to make the ride a quick one, though you’ll notice some turbo lag before 1,500 rpm. Because the TDI Cup also performs best when the revs are no higher than 4,000 rpm, you end up with a pretty limited powerband to work with. Still, you’ll have plenty of fun shifting up and down with the six-speed manual and it’s hard not to marvel at the smooth shifts of the DSG, which syncs up gears to make shifting near seamless. When it comes time to stop, the upgraded brakes do the job handily with good pedal feel, though this might be the moment when you wish the sport seats were a bit more snug. 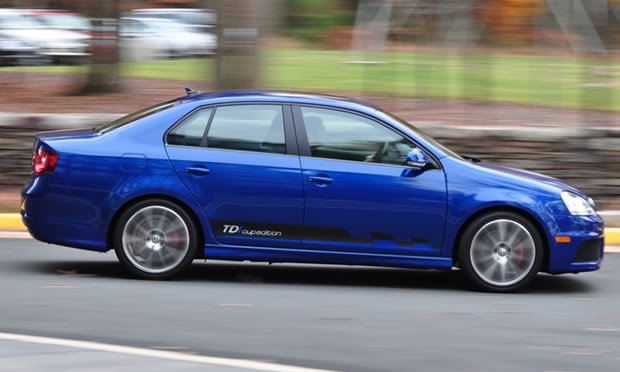 The Cup Edition retains the Jetta TDI’s fantastically efficient 2.0-liter turbo diesel engine that produces 140 horsepower and a whopping 236 lb-ft of torque. It comes mated to a six-manual transmission, but you can opt to get the smooth-shifting six-speed DSG transmission instead. A number of standard features are on offer, including Bluetooth, cruise control and an impressive sound system. An information display sits between the tachometer and speedometer, allowing easy view of mileage, fuel range, audio and phone options. All settings and audio controls can be adjusted within the touch screen located in the center of the dash. No nav is available, and the system isn’t the most intuitive to use initially. Music does seem to be held in high regard though, and there are a number of ways to connect your music to the TDI, including an SD card slot, iPod connector and auxiliary input jack. Pick your poison. Generally, cars with body kits don’t tend to evoke thoughts of fuel economy, but here you have it, a kitted-out car that returns 30 mpg city and 41 mpg highway. Compared to the regular Jetta at 23 city/30 highway, the TDI engine is a fuel saver, indeed. The interior of the TDI Cup Edition portrays a simple look, but the plaid insert seats liven things up. The large touch screen is prominently featured in the dash, with smaller controls for the HVAC system. Rear seats fold in a 60/40 split for more storage options – a good thing considering you won’t fit much of anything in the center console. A typical Jetta exterior is beefed up with a body kit that adds a front bumper, side sills and rear spoiler for a more aggressive appearance. The large brakes are hard to miss through the 18-inch wheels, and ‘TDI Cup Edition’ labeling runs along the bottom of the side doors. A regular Jetta TDI starts at $22,830, which makes the $24,990 price of the TDI Cup Edition seem like a bargain, especially considering it has no real direct competition. Honda’s soon-to-be-released $19,200 CR-Z will surely put up a fight though. Another cross-shop is the less fuel-efficient $19,185 Mazda 3 s Sport 4-Door. The TDI Cup Edition is a worthy step up from the already competent Jetta TDI, especially considering it’s only $2,000 more. Don’t be fooled, this isn’t exactly a performance car, but the upgrades bring increased excitement to the ride and a fresher overall look. Sure, we could have used a few more horsepower, but for the 41 mpg highway, it’s not anything we’d complain about. If you like the car, make sure to check out the racing series.